Concentric and eccentric strength training are the two halves of strengthening yourself. And you're probably already doing them! This article tells you what they are, their benefits, and how best to use them. Eccentric and concentric are actually different types of contractions that your muscles make. By training them both you work the different types of strong contractions that your muscles perform. 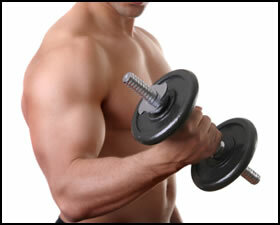 Lets look at a really simple exercise, a bicep curl like in the picture to the right. The concentric contraction is when your bicep is contracting to lift the load, from straight arm to a bent arm position with your hand at your shoulder. The bicep then does an eccentric contraction to lower the weight. It gradually relaxes to lower the weight smoothly and ends in a position with the muscle extended. The tricep muscle on the back of your arm is doing the eccentric contraction when you lift the dumbbell (the tricep ends in a lengthened position). When you lower the dumbbell, the tricep is doing a concentric contraction, ending in a shortened position. So, in any movement you have a muscle contracting concentricly and one contracting eccentricly. Why do Eccentric Strength Training? Eccentric strength training is important for everyone. For older people is helps them maintain balance and not fall down. Walking down stairs smoothly is a perfect example of eccentric strength in action. Also, eccentric strength training is much better than concentric training at causing the fatigue and micro-damage to your muscle that promotes hypertrophy, or muscle growth. If you want big muscles, include it in your routine. Eccentric & concentric strength training happen naturally as part of free weight training when you pick up a weight and then put it down. You don't have to do anything special. Just be careful of machine exercises. Your stabilizer muscles don't work as hard, and many times the eccentric part of the exercise is easier too. Try to work with free weights whenever possible. If you really want to add it to your routine, you can call it by its more common name - negative repetitions. Negatives, or 'negs', are done when you can only do the easier part of an exercises. Say you're doing a set on the bench press and you're completely exhausted. For just a few more reps, your friend helps you lift the barbell so you can lower it to your chest, getting yourself just a little more fatigued. That is eccentric 'neg' training. Working eccentric strength into your routine is easy if you use free weights. Simply do both halves of the movement fully. If you work on machines, make sure that you have resistance going in both directions when you exercise. If that's not possible on one machine, work a complimentary exercise where you move in the opposite direction. So, that's what eccentric muscle contraction and strength is all about. Pretty simple, really. You can understand what kinds of muscle contraction they are, and why it's important to include them in any workout routine that you do - especially when you're just starting out. Now all that's left is for you to go out and work it. • Click HERE to leave 'Eccentric Strength Training Info' & learn more about different Strength Training Routines!